(Elma, WA, 3/19/16)......With only one week until the 2016 Elma Auto Racing Hall of Fame Induction Ceremony and Silent Auction the EARHoF crew is busy putting together the final details for the Saturday, March 26th event to be held at Elma’s Stay Beyond Inn & Suites. 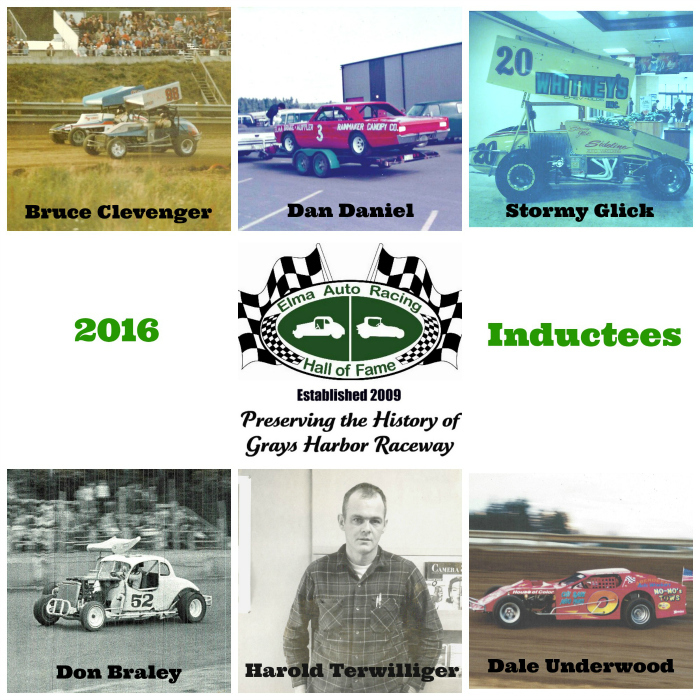 The 8th inductions into the EARHoF will see Stormy Glick, Bruce Clevenger, Don Braley, Dan Daniel, Harold Terwilliger, and Dale Underwood honored for their accomplishments and contributions to auto racing at what today is known as Grays Harbor Raceway. The activities get underway at 6 P.M. with a silent auction and social hour. Over 100 items have been donated for the silent auction with all proceeds going to the EARHoF in its effort to preserve and honor the heritage of GHR. 7 P.M will see the ceremony reach full speed. After welcomes by emcee Phil Martelli and EARHoF President Rick Leighty, the evenings keynote speaker Jerry Day will entertain the audience with details and stories about his early racing exploits which included the ½ mile on the Grays Harbor Fairgrounds. Next, Martelli will introduce the 6 honorees and give details about their careers as each is presented with a jacket, plaque, and certificate of induction. Each inductee will also have the opportunity to address the crowd. Concluding the evening will be a live dessert auction and the completion of the silent auction, along with more social time. Memorabilia will be on display throughout the night. Having outgrown the previous location at the Elma Eagles Hall, the 2016 version finds the change to the new location at the Stay Beyond Inn & Suites near the fairgrounds. Hors d’ oeuvres and cake will be served and a no host bar manned by Eddy Bachman of Elma Lanes will be available. The event is open to the public, with no age limit. A small $5 admission will be charged to help with room rental. Make plans to help honor the greats from our racing past, listen to great stories, view and revive memories, and support the Elma Auto Racing Hall of Fame on Saturday, March 26th.